Wired! (the Pop/Contemporary division of MVSJ) sits on the cutting edge of 21st Century live string music entertainment and adds a sophisticated groove and energy to contemporary wedding ceremonies, receptions, and corporate events. With an ever-expanding set list, our music selection matches or surpasses that of any peer company in the South Texas region, and will always be performed with the famous MVSJ string sound. Please note: For those who prefer a mixture of styles and sounds, Wired! will gladly combine classical/traditional repertoire with popular/contemporary hits. Wired! 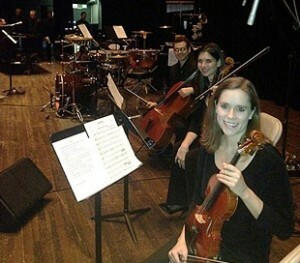 Pop/ Contemporary Strings music list includes many of the most requested popular hits from the 1960’s to the present, while our ROCKTET list focuses on popular, though less commonly requested rock and other pop titles in our collection. During busy periods, ROCKTET repertoire may require a 2-hour minimum contract. Please inquire for availability. Custom requests (music not already on our repertoire lists) can almost always be accommodated by our in-house sheet music arranger for a nominal fee. For high-energy corporate events or large parties and receptions, MVSJ can enhance any Wired! ensemble with a rhythm section or electronic media. Wired! String Trio (Two Violins and One Cello) also available. Priced from $700. We invite you to take your time, listen carefully, and explore the wide range of musical styles and entertainment available to you through MVSJ. With MVSJ, the musicians and/or the caliber of performance you hear online are exactly what you will hear at your event. A new take on the string quartet, always a hit; modern rhythmic beat and play list with classic sophistication; ideal for any size event indoor or out. To avoid being directed away from our website, please do not click on the YouTube watermark in the above videos. One of our most versatile combinations, this duo offers classic elegance with contemporary flare appropriate for any size event. All the energy and style of our other Wired! groups, yet perfectly suited to small- and medium-sized events indoors or out. Click to expand our Wired! and Rocktet Music Lists below. All music on this list (except where otherwise noted) is available for performance by Wired! String Quartet and most can be performed by Wired! String Trio. However, at this time the Wired! Violin/Guitar Duo only performs selections marked with a (+). Wired! Solo Guitar also performs only selections marked with (+). Titles marked with an asterisk (*) are available exclusively to our Wired! customers. Custom sheet music arrangements (titles not already in our collections) can usually be produced for a nominal fee by our in house arranger. Optional rhythm section (drummer) can be added to enhance any Wired! ensemble. Numerous other Latin tunes are available for violin and guitar duo. j. What Is This Thing Called Love? Our ROCKTET list picks up where the Wired! Pop/Contemporary Strings list leaves off! ROCKTET repertoire (listed below) may require 2-hour minimum contract during busy periods. Please inquire for availability. You will hear the MVSJ difference. Prospective clients may always request invites to upcoming live MVSJ performances.